AdBlock is a browser extension, which blocks advertisements while you surf the net. However, there may come a time when you want to uninstall AdBlock from your browser. In this article, we will share the ways to uninstall AdBlock from major browsers on a Mac. 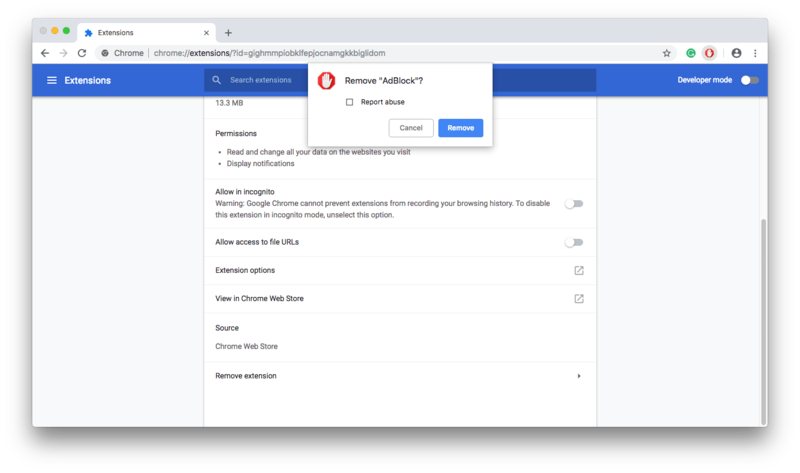 How to uninstall AdBlock from the Opera browser. How to remove AdBlock from Firefox. How to delete AdBlock from Chrome. How to uninstall the AdBlock Safari extension. How to easily uninstall browser extensions. Launch the Opera Browser. 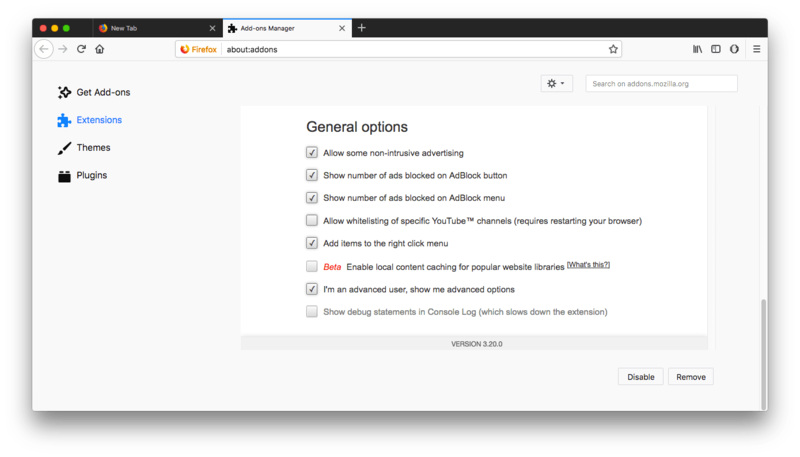 Right-click on the AdBlock icon on the right of the Opera menu → select Manage Extension. Select AdBlock in the list of the Opera Extensions. Deactivate AdBlock by clicking on the Disable. Click on the red X icon on the right to remove AdBlock from your Opera browser. Launch the Firefox browser. Open the AdBlock submenu by right-clicking on the AdBlock icon in the Firefox menu → choose Manage Extension. In the window that appears, you will see AdBlock extension data. Scroll down to the General options. Click on the Disable button to disable AdBlock Firefox. Click on the Remove button to delete the AdBlock extension in Firefox. Extensions in Chrome can be deleted in two ways. You can launch the Chrome browser → select the AdBlock icon in the Chrome menu on the right → right-click and select Remove from Chrome from the drop-down menu. Secondly, you can remove AdBlock from Chrome by choosing Manage Extensions from the menu that appears when you click on the AdBlock icon. In the Chrome Extensions’ window that appears, you can disable AdBlock by clicking On/Off. Scroll down and click on Remove extension → confirm the action by clicking Remove. Launch the Safari browser. Click Safari in the menu bar and select Preferences from the drop-down menu. 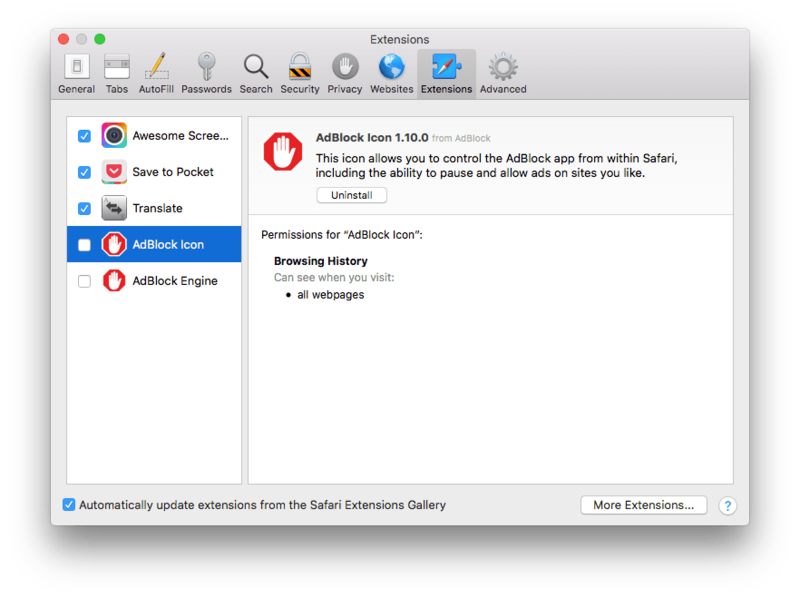 Untick AdBlock Icon and AdBlock Engine in the list of Extensions to disable AdBlock in the Safari browser. Quit Safari. Quit the AdBlock application if it was launched. Open the Applications folder → choose AdBlock.app → right-click and select Move to Trash → Empty the Trash bin. Unfortunately, these steps are not enough to entirely uninstall AdBlock from your Mac. Due to the nature of applications, they create service files in your Mac’s home folder. After the deletion of the AdBlock app’s executable file from the Applications folder, its useless service files are still stored on your Mac. Therefore, we recommend using App Cleaner & Uninstaller to remove AdBlock from your Mac completely. 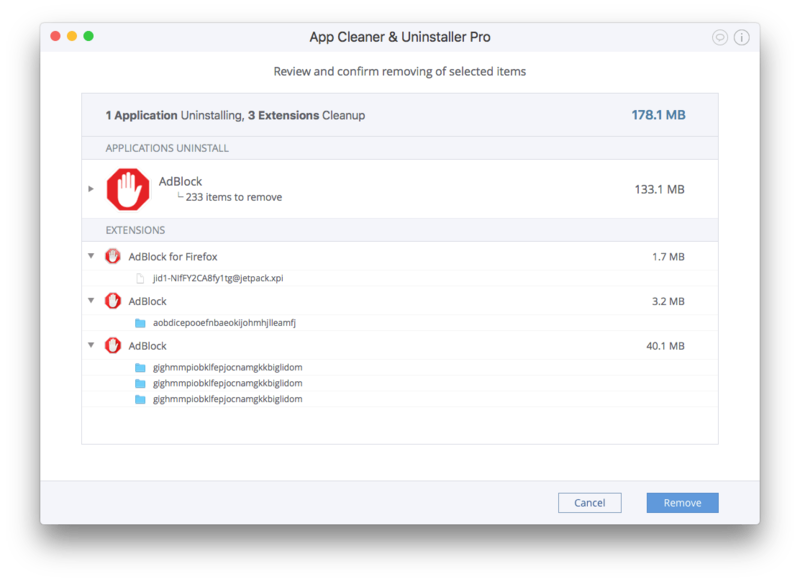 App Cleaner & Uninstaller allows you to uninstall Mac apps completely and manage system extensions. The app has an Extensions tab, where you can find all your extensions, including Web Browser Extensions. You can select AdBlock from each of your browsers in one window and delete them. Click Remove to get rid of all AdBlock extensions at once. In the Applications tab, you can select the AdBlock app with all its service files and delete them by clicking Uninstall. Overview the items you are going to delete and click Remove. Enter your user password to confirm the action. 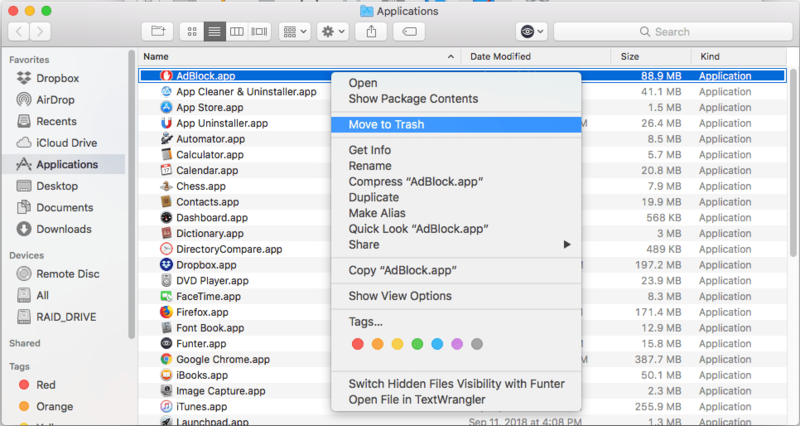 Complete the AdBlock uninstallation from your Mac by emptying the Trash. We hope that our guide will help you to disable AdBlock and delete it from your Mac easily. We highly recommend using the App Cleaner & Uninstaller software to uninstall AdBlock for Safari from your Mac. 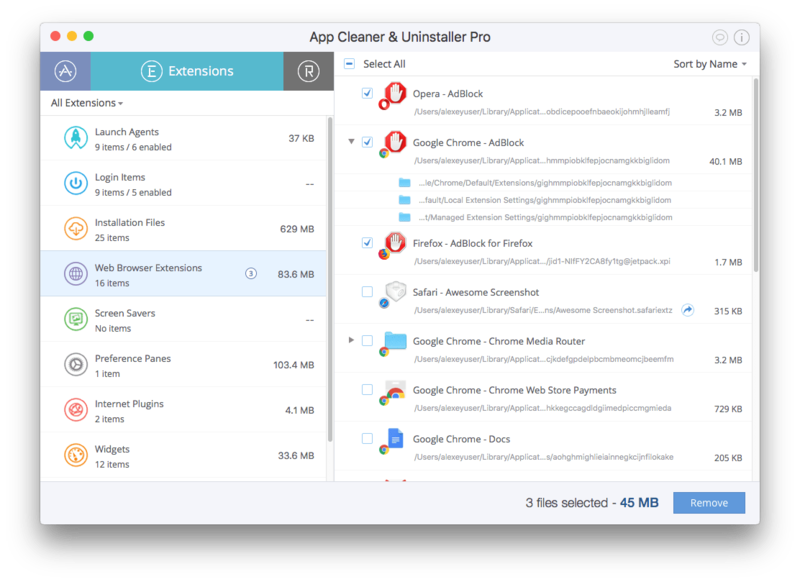 As shown above, App Cleaner & Uninstaller helps you to delete web extensions of all browsers at once. Besides that, it also helps to get rid of useless apps and their leftovers in just a few clicks.